Every year, Forbes makes a list of world’s most promising young entrepreneurs. This famous list contains the names of only 300 women and men around Europe (divided in 10 different industries), whose accomplishments has inspired their respective nations and whose remarkable actions have lifted others to do the same, also known as Forbes 30under30. If you’re an entrepreneur this sacred list is kind of like your Holy Grail. It’s the very peak of your career, the cherry on the top, better yet, feels like the overdue Oscar, Leo finally got. But see, the thing is that for most of the entrepreneurs on there, this list is just their stepping stone to even greater achievements to come. It’s kind of like their drive spark to do and be better, as well as their reward for all the sacrifices they’ve made throughout the years, but never ever their final destination. Probably this is the reason why they are the greatest of the greatest, because they always strive for more. 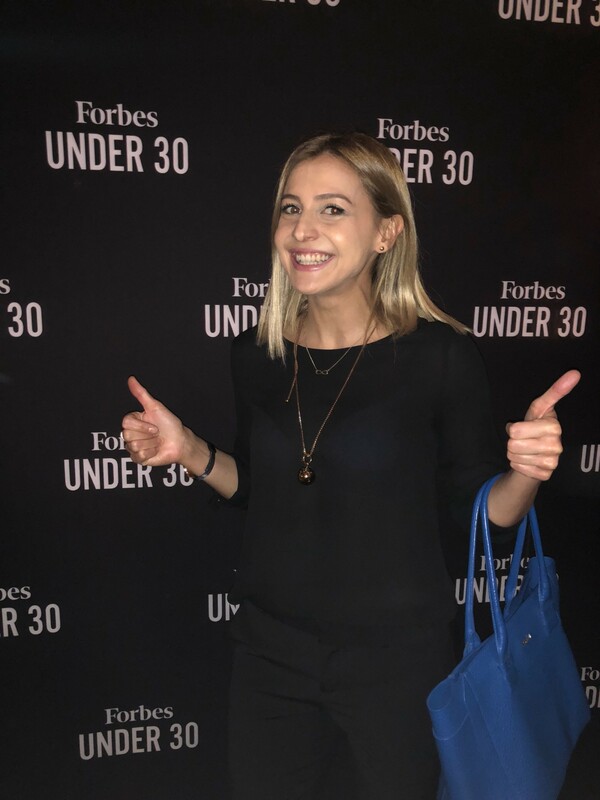 For the 29 years old fierce girlboss, Nina Angelovska, being a part of Forbes 30under30 is the long overdue reward for all the sleepless nights while building a business from the ground up and just the tip of the iceberg of her amazing entrepreneurial journey. This extraordinary woman is a force of nature in her own right. In addition to being a co-founder and CEO of Grouper (Macedonia’s biggest e-commerce platform), Nina is also a president of the first e-commerce association in Macedonia and an e-commerce and marketing consultant. Oh, did we mention she has a PhD? Well, she does, which makes her awesome af and obviously our next “Cool Face of Bastet Noir”. BASTET NOIR: Who is Nina? NA: I don’t like describing myself but in few words — fast and well organized workaholic who loves and enjoys what she does. BASTET NOIR: Congratulations on making the Forbes 30under30 list. We’re so proud to have someone like you representing Macedonia. Could you tell us a bit more about what this means to you and how did you reacted when you found out? NA: Thank you! That awarding feeling you get when your hard work has been recognized is always amazing but when it comes from Forbes it is uber amazing. The excitement was even greater because the same day when Forbes “30 Under 30 Europe 2018” list was published Grouper was celebrating its 7th birthday. I don’t know if it was the universe or lucky number 7 but it certainly caused a throwback of the beginnings of Grouper, all the challenges we overcame in the past seven years, all the struggles, all the beautiful moments, all the success, all the ups and downs, all the amazing people that were my support and motivation… which got me pretty emotional. I was enjoying the beautiful streets of London before the launch celebration and finally stopped for a moment to reflect and appreciate the success I have achieved so far. We live an extremely fast life and usually we don’t get to find time to do this, rather we dive into getting things going and working too hard all the time. The recognition of Forbes came as a cherry on top, it definitely is a motivation but at the same time a commitment to continue the hard work and try to become better day by day. BASTET NOIR: What’s the first thing you do every morning? NA: Coffee first and quick shower while it boils. While I drink my coffee I go through my daily agenda, then push the START button and there it goes another busy and fulfilled day. BASTET NOIR: How do you motivate yourself in times when you find yourself uninspired? NA: I’d say when you are passionate about the work you do, motivation is never an issue. I come from the lucky club where my work is my hobby at the same time. Of course the feedback, the results and the recognitions are always a key source of motivation. NA: I have seen dozens of motivational speeches but to be honest lately I don’t have much time and I cannot recall of a particular favorite. By definition motivation impels for action and while all the amazing motivational speeches are inspiring they can stimulate temporary motivation that can fade out. I believe motivation is a force that comes from within and everyone should find his own way and source of motivation and take good care of it. NA: Jack Ma, Jeff Bezos, Elon Musk and some more masterminds and legendary visionaries. NA: If you are thinking of starting a business be sure that your passion about your idea or product is in line with the market needs and wants. Then before you dive into the business adventure be sure that you are willing and capable of giving “a part of yourself” in your business, that you are willing to dedicate lots of hours of hard work and make sacrifices on the way. Be prepared for learning and doing new stuff that you might not always be excited about but are simply things that have to be done. And in this faster than ever digital world be aware that the ability for fast learning, thinking and decision making are crucial if you want to be on top of your game. Practice what you preach, lead by example, believe in yourself and always stay positive. Anything can be done and it can be fun. BASTET NOIR: So what’s next for Nina? Any plans, goals? Grouper is my first baby, so I would obviously continue to work towards its growth and development further on. Of course, having the best team helps. I think I’m very lucky, because I’m surrounded by so many great people who work for Grouper. This year, the biggest challenge I have to face is taking the role of the president of the first e-commerce association in Macedonia. Among some of the things I’ll be doing there include lobbying for inclusive e-commerce, which means lowering the barriers to entry that limit the growth, educating people about e-commerce and supporting everyone who wants to take their business online. There are also so many other things going on, like being a mentor and a speaker, consultant for companies who want to increase their online sales and strengthen their online presence. In addition to that, I’m also a member on the panel for start-up competitions. Oh, gosh, there are so many things I want to do and so little time. I just wish there’s a coupon on Grouper where you get to pay for 30 minutes time and you get to have 60 minutes time, haha. Wouldn’t that be nice? BASTET NOIR: How would you describe your personal style? This marigold shirt dress is my favourite. Dreaming big takes you places, but working hard is what will make that dream eventually become a reality. We all have different definitions of success. Some of us define it as a financial gain, others as spiritual fulfillment. Ours is having to work with such amazing women like Nina. These muses shape our world, define our dreams, push us to be better, dream bigger and dare more. Let this be a lesson to all of you out there who dare to dream. Dreaming big is not just a beautiful fantasy in your mind, but an absolute necessity to achieve everything you’ve ever wanted and more. So here’s to all the bold and strong badass babes out there, as people often would like to say, may we know them, may we be them, may we raise them. If you liked Nina’s story, there’s plenty more to come, just hit that sign up button to get in our inner circle of coolness and never ever miss a thang.